Proprietary Name: Gentamicin Sulfate What is the Proprietary Name? Non-Proprietary Name: Gentamicin Sulfate What is the Non-Proprietary Name? Gentamicin Sulfate with NDC 68788-7336 is a a human prescription drug product labeled by Preferred Pharmaceuticals Inc.. The generic name of Gentamicin Sulfate is gentamicin sulfate. The product's dosage form is solution and is administered via ophthalmic form. FDA Application Number: ANDA062196 What is the FDA Application Number? 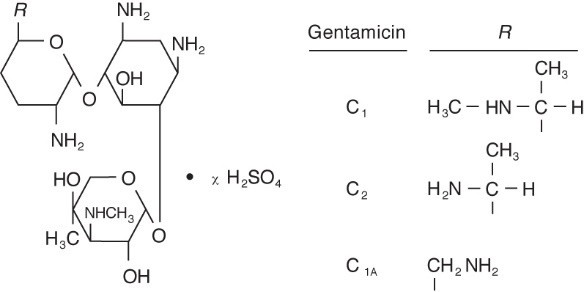 Gentamicin Sulfate is a water-soluble antibiotic of the aminoglycoside group. Gentamicin Sulfate Ophthalmic Solution is a sterile, aqueous solution buffered to approximately pH 7 for ophthalmic use. Gentamicin is obtained from cultures of Micromonospora purpurea. It is a mixture of the sulfate salts of gentamicin C1, C2, and C1A. All three components appear to have similar antimicrobial activities. Gentamicin sulfate occurs as white powder and is soluble in water and insoluble in alcohol. The structure is as follows:Established name: Gentamicin SulfateChemical name: 0-3-Deoxy-4-C-methyl-3-(methylamino)-β-L-arabinopyranosyl-(1→6)-0-[2,6-diamino-2,3,4,6-tetradeoxy-α-D-erythro-hexopyranosyl-(1→4)]-2-deoxy-D-streptamine.Ingredients: Each mL contains: Active: Gentamicin Sulfate USP (equivalent to 3 mg gentamicin). Preservative: Benzalkonium Chloride 0.1 mg (0.01%). Inactives: Sodium Chloride, Dried Sodium Phosphate, Tyloxapol, Sodium Hydroxide and/or Hydrochloric Acid (to adjust pH) and Purified Water. Microbiology: Gentamicin sulfate is active in vitro against many strains of the following microorganisms:Staphylococcus aureus, Staphylococcus epidermidis, Streptococcus pyogenes, Streptococcus pneumoniae, Enterobacter aerogenes, Escherichia coli, Haemophilus influenzae, Klebsiella pneumoniae, Neisseria gonorrhoeae, Pseudomonas aeruginosa, and Serratia marcescens. Gentamicin Sulfate Ophthalmic Solution is indicated in the topical treatment of ocular bacterial infections, including conjunctivitis, keratitis, keratoconjunctivitis, corneal ulcers, blepharitis, blepharoconjunctivitis, acute meibomianitis, and dacryocystitis caused by susceptible strains of the following microorganisms: Staphylococcus aureus, Staphylococcus epidermidis, Streptococcus pyogenes, Streptococcus pneumoniae, Enterobacter aerogenes, Escherichia coli, Haemophilus influenzae, Klebsiella pneumoniae, Neisseria gonorrhoeae, Pseudomonas aeruginosa, and Serratia marcescens. Gentamicin Sulfate Ophthalmic Solution is contraindicated in patients with known hypersensitivity to any of the components. NOT FOR INJECTION INTO THE EYE. Gentamicin Sulfate Ophthalmic Solution is not for injection. It should never be injected subconjunctivally, nor should it be directly introduced into the anterior chamber of the eye. Prolonged use of topical antibiotics may give rise to overgrowth of non-susceptible organisms including fungi. Bacterial resistance to gentamicin may also develop. If purulent discharge, inflammation or pain becomes aggravated, the patient should discontinue use of the medication and consult a physician. If irritation or hypersensitivity to any component of the drug develops, the patient should discontinue use of this preparation, and appropriate therapy should be instituted. To avoid contamination, do not touch tip of container to the eye, eyelid, or any surface. There are no published carcinogenicity or impairment of fertility studies on gentamicin. Aminoglycoside antibiotics have been found to be non-mutagenic. Pregnancy Category C. Gentamicin has been shown to depress body weights, kidney weights, and median glomerular counts in newborn rats when administered systemically to pregnant rats in daily doses approximately 500 times the maximum recommended ophthalmic human dose. There are no adequate and well-controlled studies in pregnant women. Gentamicin should be used during pregnancy only if the potential benefit justifies the potential risk to the fetus. Bacterial and fungal corneal ulcers have developed during treatment with gentamicin ophthalmic preparations. The most frequently reported adverse reactions are ocular burning and irritation upon drug instillation, non-specific conjunctivitis, conjunctival epithelial defects, and conjunctival hyperemia. Other adverse reactions which have occurred rarely are allergic reactions, thrombocytopenic purpura, and hallucinations. Instill one or two drops into the affected eye(s) every four hours. In severe infections, dosage may be increased to as much as two drops once every hour. 9007184-1011Manufactured ByAlcon Laboratories, Inc.Fort Worth, Texas 76134 forSandoz Inc.,Princeton, NJ 08540Rev. December 2018Relabeled By: Preferred Pharmaceuticals Inc.